This large, three-fold leaflet, from the late Brian Green's collection, was distributed with the 1965 Puppet Master Magazine. 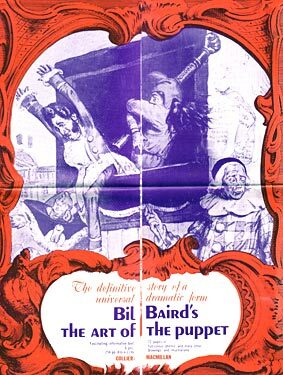 It advertised the forthcoming publication of US Puppeteer, Bil Baird's Book, The Art of the Puppet, one of the most highly regarded puppet books ever produced. Bil Baird, perhaps the foremost puppeteer in the world today, writes in Chapter 1 of The Art of the Puppet: "The impulse to make puppets is nothing new. People have been creating them for thousands of years and why? What is the fascination of puppetry?... It is part of man's ancient urge to recreate life that results in this many-layered art. More diverse than painting, sculpture, dance, song, or poetry, puppetry has something of all of them. It is a means of communication, an extension of human expression." In this well-written and beautifully illustrated volume, Mr Baird presents the only complete history of puppetry, an important area of the theatre which, until now, has been unjustly neglected. His narrative, beginning with the cave man and following the development of civilization through the Orient and the Western world, examines the famous and outrageous Mr Punch, the raucous Karaghoz, the Knights of the Orlando Legend, the lovely shadow plays of Asia and the unusual Bunraku puppets of Japan. Mr Baird describes the puppets of the American Indians and then goes on to trace the evolution of American puppetry up to the present day, when the puppet is used as a major teaching tool. In addition, the book deals with the more technical aspects of puppetry. Plays, descriptions of old performances, discussion of the problems of performing and the making of puppets (with sketches done especially for this book by Mr Baird) are all included. With its exciting narrative interwoven with many beautiful illustrations, The Art of the Puppet covers in detail both the history and technique of puppetry. It will be of great value to art lovers, theatre buffs, social historians and everyone interested in this unusual art form. Bil Baird was formerly Puppet Master to Tony Sarg. He, his wife Cora and their troupe have performed all over the world, from India to Moscow, from Broadway to their own theatre-loft home in Greenwich Village, New York. They are frequently seen on television and perform at the World's Fair.